Rent, a classic Broadway stage musical is getting to packed houses in a capital theater and large anxious crowd that can´t get enough entries. The Chamber Tito Junco Cultural Complex Bertolt Brecht, is besieged by large numbers of people before each performance, it will be in theaters until next March. 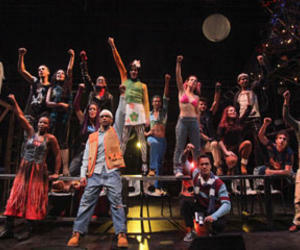 Actors and actresses from Cuba not detract at all the original cast of this piece of Jonathan Larson, whose premiere took place on Broadway in 1996 and remained in theaters for 10 years, with impressive haul of prizes and a homonymous film sequel, filmed in 2005. Represent Christmas Day: In Havana one of the intentions of the deceased author, never materialized fulfilled. Such was the power and sincerity of delivery, at the end of this function, excited, Robert Nederlander, Nederlander Worldwide Entertainment manager said that Rent was another step in the many other joint projects to come between your company and Cuba.